While traveling there are a lot of ways to cut your costs, whether it is by finding cheap flights or getting a discounted hotel room. 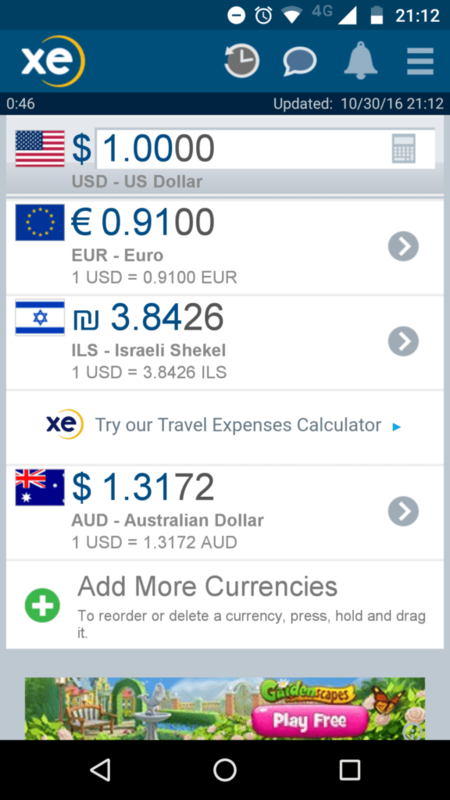 Other than saving while on the trip, there are apps that can make your life easier. There are countless of handy apps such as a currency app, one that helps you pack your essentials, find good airplane seats, and even where you can go pee. There are many free apps that assist every day like google maps, waze, whatsapp, and more… If you ever wondered what are the best apps to download before going on your next trip then you’ve made it to the right place. Keep reading to discover which apps will save you money and make your life easier. How many times were you on your way to the airport and found out that you forgot something at home, and it was too late to go back? How many times have you over packed your suitcase with things you never ended up using? With Packpoint app you can easily pack without thinking about what you need and what you don’t. 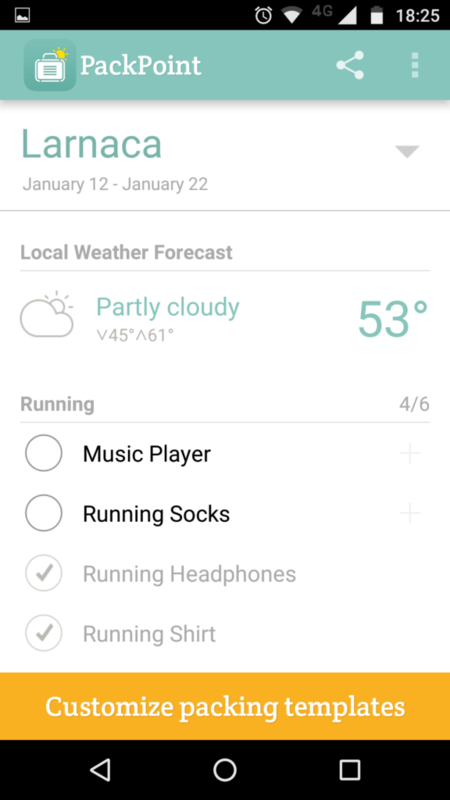 What’s cool about this app is that it gives you a list of things you need to pack according to your destination. It plans according to weather and activities. It thinks for you, have I made your life easier yet? Whether you don’t like to book in advance, you went on a spontaneous trip, or you just want to extend your trip, then Hotel tonight app is for you. 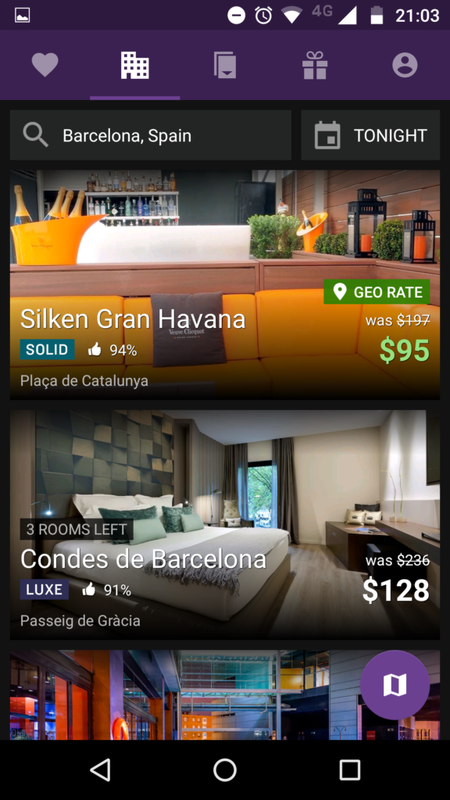 It lets you find the cheapest hotel room for the same night. Its prices are highly discounted and it’s very easy to use. Proud to say that it is an Israeli-development. 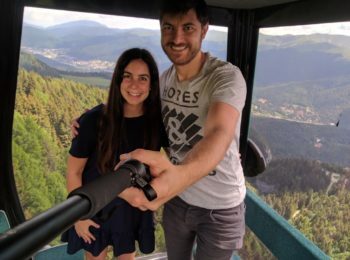 Travel maker goal is to help you find the perfect travel buddy for your trip and to also get tips and recommendations both from locals and tourists. You can filter your travel companions by age, gender, hobbies, locations, etc. You can also check out their profile before reaching out. 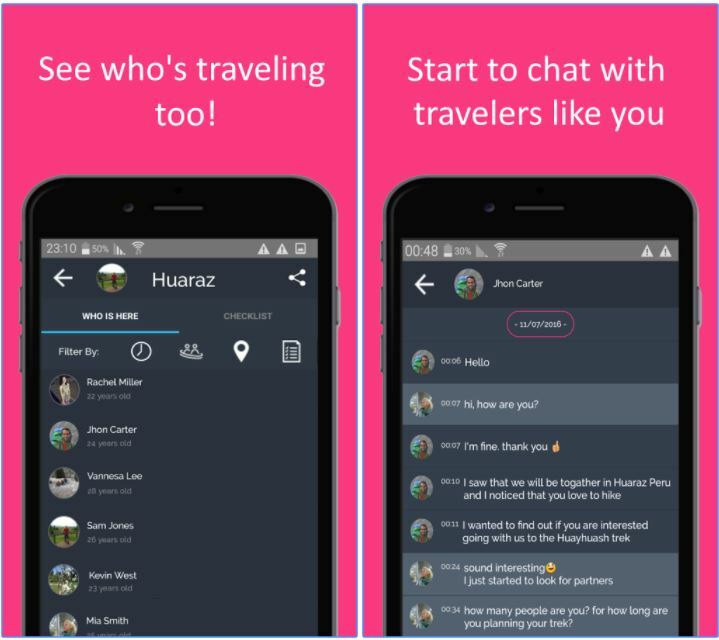 It’s sort of like a dating app, but for traveling; you can chat with your matches. You can also get a recommendation for a list of equipment you’ll need to bring, from camping to leisure trips. The app is easy to use, and it enables you to find partners that will make your next trip better. It’s also a great opportunity to meet up with locals. There is an android version that has thousands of users worldwide. As you may know, not all seats on an airplane are the same, so if you’d like to book extra leg room, or even a window seat, then Seatguru is app is perfect for you. 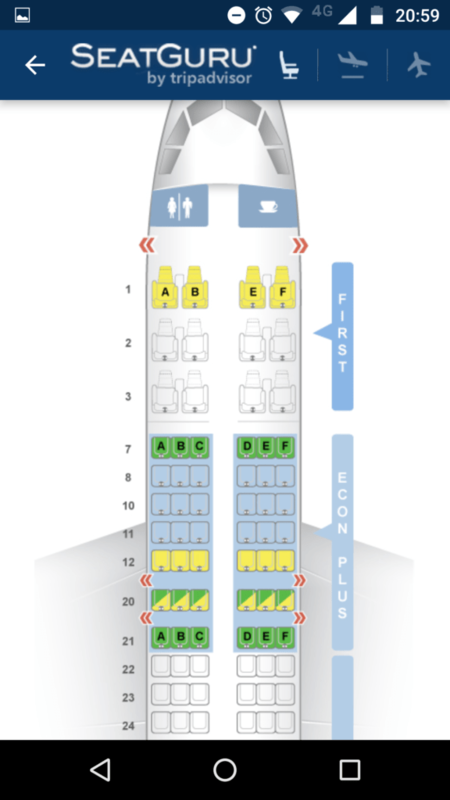 The app gives you a color-coordinated seating chart, from the best to the worst seat. You won’t have to pay extra for a good seat thanks to this app. What’s great about this app is that it works without wifi. With XE Currency, you can change any coin you’d like, you can see graphs of the coins according to its changes, and you can easily see the price in your coin no matter where you are. It works in all devices. Sounds like an embarrassing app, right? But how many times have you found yourself almost dying while looking for a public restrooms, and especially while traveling?. 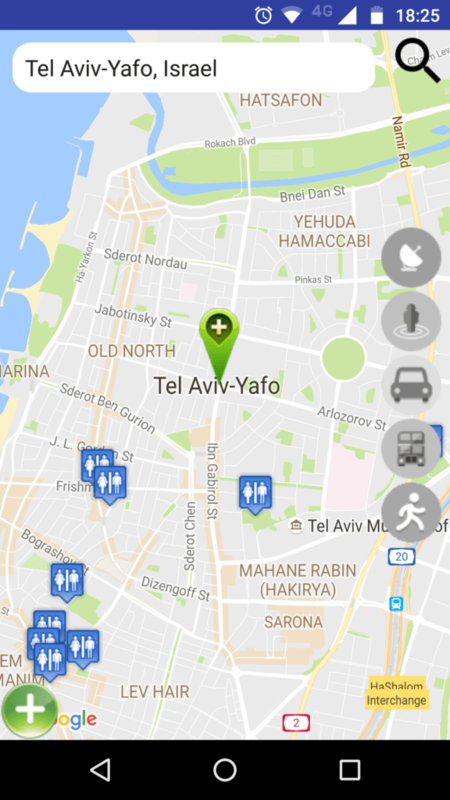 This app features a map and the nearest public restrooms around you. It is fantastic. Restaurant finder is one of my most-used apps while traveling. 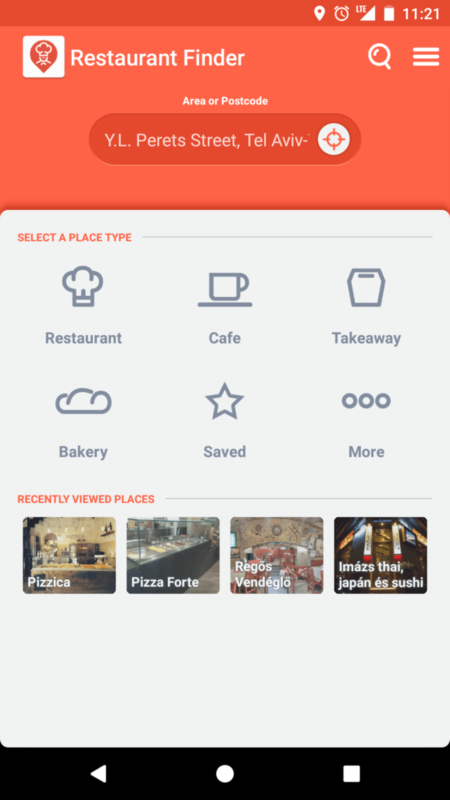 Whenever we feel like going to a restaurant, cafe, or a bar and we’re not sure of where we should go to, we use this app. It shows you the nearest options and you can also filter and narrow your options down by the type of food and hours. Every place has a rating. I always look for the places that have 4 or more stars and look at the reviews that other people wrote. With its help we found a lot of great places we would otherwise never have found. I highly recommend downloading this. It works on Android. This app is really easy to use and we actually use it a lot while traveling. We even used it in Vietnam. It helps you find the public transportation that you need. 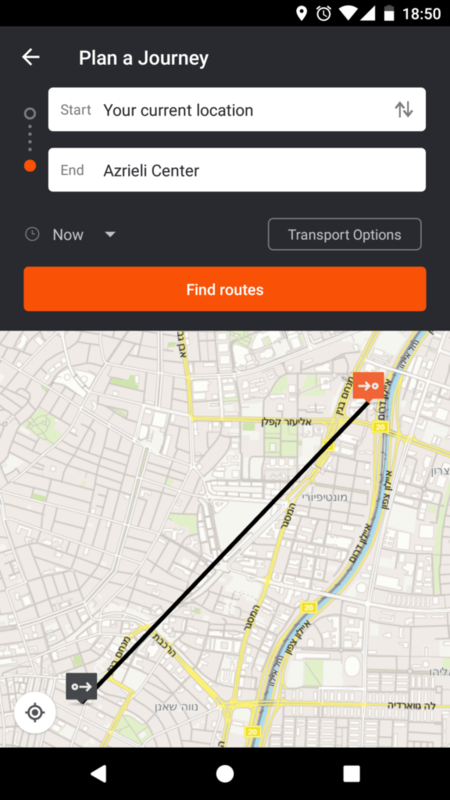 It shows which bus you have to take to get to your destination, and it shows you the location of the station. It also shows in how many more stops you’ll need to get off, so they basically thought of everything. If there is a walk, then it would also show you the course. The app is very easy to use, and it would save you a lot of money you’d spend on taxis.